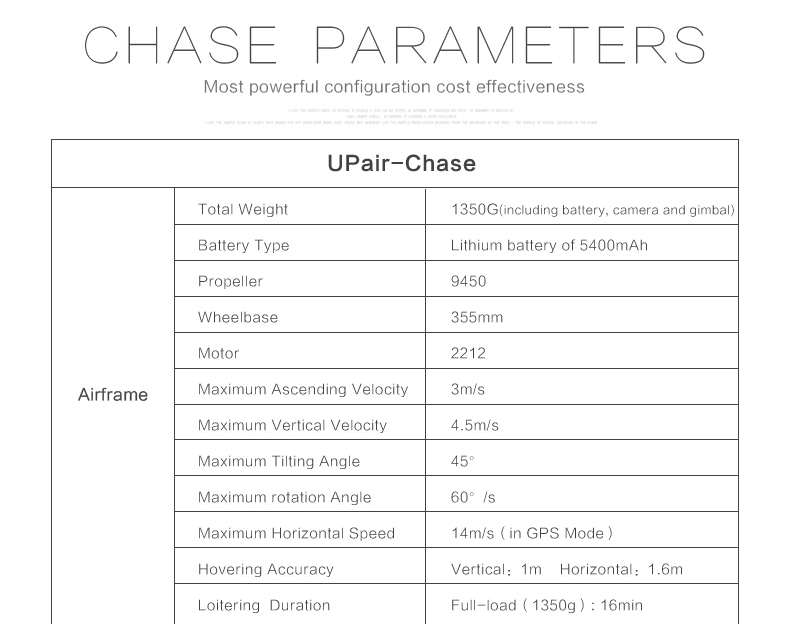 Edit2: The UP Air UPair-Chase is now available in two configurations. The 2K version is £363.01 (+£7.87 P&P) and the 4K model is £396.01 (+£5.21 P&P). Neither of these prices include the discount code given above. I think the extra £30.34 is worth it, if you can stretch to it, for the future proofing that the 4K model will give you even if you don’t currently have a platform to view it on. The listing on Banggood also suggests the UPair-Chase comes with a travel bag and it looks fairly sturdy from the photos. Specs (see bottom of this page) are fairly thin on the ground at this time, and those available should be taken with a pinch of salt until independent testing has been done and the consumer reviews begin to find their way online, but this low-cost full feature quadcopter looks set to overthrow the Wingsland Scarlet Minivet and the recently released DJI Phantom 3 Standard for the title of the best beginners aerial photography drone. A title almost as catchy as the name it was given! Seriously though, Chinese manufacturers appear to miss the trick when it comes to naming the products and I suspect that DJI’s (also a Chinese manufacturer) success has been to the simple naming convention it has used to differentiate products within its various ranges. It has been mere hours since I wrote about the new entry to DJI’s line and already I’m back to talk about another offering which shows how fast things move in this fledgling “drone” industry. Purists (read: super geeks) get upset when the public call quadcopters “drones” but as the latest batch of quads come through with some degree of autonomous flying capabilities this becomes less of a misnomer. Most over £250 have position/altitude hold using GPS or barometric altitude sensors and, as the price goes up, so do the drone-like features such as automatic return to home (RTH) when the connection cuts out or a switch is pressed. Spend around £350 and they will even land themselves or allow you to plot a course to fly. When you get up to the Phantom 3 Standard level they will even follow you in whatever activity (or vanity project) you’re taking part in by utilising a GPS device in the transmitter or your phone. What is great to see is these premium features quickly filtering down to the lower priced models. Whilst it took decades for some automobile advancements, such as electric seats, automatic window wipers and remote locking, to make their way from high-end luxury brands to the mass-produced family cars; we are seeing manufacturers in the aerial photography market quick to steal ideas from the competition. This should be good for us, the consumers, as long as it doesn’t stifle invention in the long run. Nice looking controller with large 7″ screen sets this apart from the competition. The UP Air advertises waypoint flight planning, automatic return to home and otherwise similar specs to Wingsland’s model. What makes this the more attractive offer is the higher pixel count camera (12MP instead of 4MP) and a 7″ screen compared to the tiddly 2.4″. Despite having “chase” in the title it doesn’t appear to have a follow mode unfortunately. However, and I think this may be a first, it appears to have wifi sharing capability to smartphones/tablets as well as the dedicated screen although it is not clear over what sort of distances. Expected to be in stock at Banggood in the next three days and priced at just £362.95, with free delivery, this is set to be the bargain of the year. Banggood have been known to fluctuate prices after a product launches so check back here for updates or bookmark this link. Disclaimer: These specs have been taken directly from the manufacturer’s website and are, as yet, unverified by customers. Hi Margret, I haven’t flown the UP Air-Chase so I can’t comment personally. My previews are generally based on the views and experiences of those on a multitude of forums but I’m hoping to receive a review model soon so will keep you updated if/when this happens. Very interessant compliments for this first review. Im looking for such a drone and sincerely ill take it in account with x380, Scarlet minivet, cheerson x22, dji3 advanced. Hi Paolo, thank you for reading. My recommendation has changed based on a few reports recently whereby the UPair-chase has a few design flaws/choices which make it less appealing. I would favour the DJI Standard or Cheerson CX-20 as RTF options. The later will require you to fit camera, VTX and purchase a screen (or goggles) but that allows you to customise the quadcopter to your tastes and learn more about this fantastic hobby in the process. I own the UpAir Chase and while a respect every ones right to their own views, I can say this is a state of the art stable flyer and video shooting is awesome as well. I can’t say so much about the design flaws/choices. Maybe it is true, but then again is it a flaw if it was chosen to be this way? Then it would rather be a choice instead, but I suppose that is up for every person to make a view on that. If you want a bit cheaper quadcopter which is HIGHLY stable, has the basics working 100%, is good for making awesome videos, is made of good material, then this is a good buy for sure. Nothing is perfect, not even the awesome DJI Phantom is perfect. I would say buy the UpAir if you want a good Quad for making videos. Buy the DJI if you want even more extra features such as follow me mode. Buy the cheerson CX20 if you are willing to spend much on spare parts. Sure a good pilot can prevent crashes, but the cheerson cx 20 is for sure the less good one of the other two because the chersoon cx 20 is not robust compared to DJI and Chase. The UpAir chase will soon feature a gopro 4 ready gimbal available as extra. Follow your instinct and buy the one you would like the most. UpAir Chase or DJI if you want my advice. 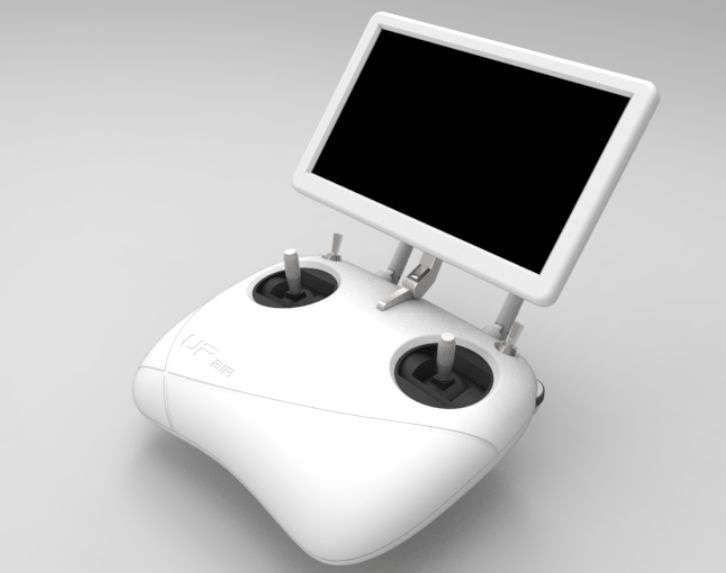 At least you get a large 7 inch monitor for the UpAir Chase and an equal flying performance as the DJI for less money. If you want all the features as well then DJI would serve you better, but both are equally as good flyers for making good videos. It is possible to mod the upair chase so it will support mission planner. Just make a search on youtube and see for your self. Hi DroneDirector, thank you for your comments and I’m glad you are enjoying your UpAir Chase. This was a First Look post not a review and I don’t own a Chase so I can only consolidate others reviews and assimilate them into my own. There are issues with this quad meaning it is not perfect “out of the box” but that’s not to say that it isn’t a great performing quadcopter with excellent aerial photography capabilities, fast GPS connection and powerful transmitter for extended flight range. Nothing is perfect in this hobby and the Chase is definitely worthy of a look for people wanting a sturdy and stable flying platform. If it were my money, however, I would rather go for the Cheerson CX-20 as it is cheaper to begin with and will be easier to perform the required upgrades. It also allows you to purchase the setup you want and add parts and capabilities as necessary and when funds allow. I am happy to take new toys apart and make changes but for someone who wants to pick up and fly the Phantom 3 Standard is the go to first AP quadcopter. True, these are valid issues you point out, no doubt about it and anyone wanting to get the Chase should know that. It is a must to have good soldering equipment if one is going to take apart the Chase, and also time and steady hands. I tend to compare the Chase to French cars in some ways. At some point I am going to install a Circular Polarized VTX Antenna to drastically increase its range. Not sure if this is the one I will chose though. I stumbled upon this video short after my earlier post. A guy from Thailand flying his Chase. The FireFly 5s does a good job (not my video). 1. I live in the Uk we dont really get bright sunshine lol…plus i dont think ill be taking it out to great distances as im learning. 2. I work in electronics so no probs soldering. 3. not too bothered about mission planner as im learning and want a simple transmitter not one loaded with buttons. 4. im sure i can press a reset button every now and again lol…. I need this drone in my life lol… Banggood have it and at a good price from China but I dont know the site and if its legit or trustworthy. Hi Carl, I have bought a LOT of stuff from banggood over the last year and haven’t had a problem yet. Occasionally may you get stuck with having to pay customs charges but its only happened to me once so far. I just bought two eachine h8 minis (one standard and one 3d) plus a cheerson CX-10wd that I plan on reviewing soon. They all arrived within 6 working days which is pretty good when you think how far they’ve come! The wingsland scarlet minivet has just had an update and now comes with a larger screen so I’d check that out too but the UPair Chase is still my number one choice in this class. Let me know how you get on with it if you do buy it! One other thing is that the electronics on the UPair were improved when the company was bought out so there are more connectors and less direct solder joints so maintenance should be easier!